Money money money money, MONEY. Most likely, you’re wondering why that is. Because as an entrepreneur, your dreams probably consist of rolling in the dough sooner rather than later. And, better yet, while you sleep. Yes, that’s what’s known as passive income. What that means is, you have the opportunity to generate income and maintain that cash flow with little to no effort on your part. No need to spend time creating a product or service. And, no need to scrounge up some of your hard-earned money to throw into the pot. So, what’s one money-making strategy that’ll help you create a passive income stream? Affiliate marketing. If you’re an avid Amazon.com customer, this term might be familiar to you thanks to the company’s Amazon Associates affiliate program. But, there are plenty of other affiliate programs available to you. The idea is that you sign up to promote products or services you like on a bridge page—aka a “bridge the knowledge gap” to guide your audience to your main sales page. Then, when your readers click on the link and end up buying those products or services from your affiliate marketing efforts, you’ll earn a commission. Pretty straightforward, right? And, it’s a win-win situation for all parties involved—the company, the customer, and yourself. The company gets a sale from a customer they might not have had the chance to reach. The customer learns about a new product or service that can help alleviate their biggest headache. And, you roll in some dough. But, as a beginner in the affiliate marketing world, it can be tough to know where to begin to ensure you pick the right products or services your audience will appreciate and want to buy! 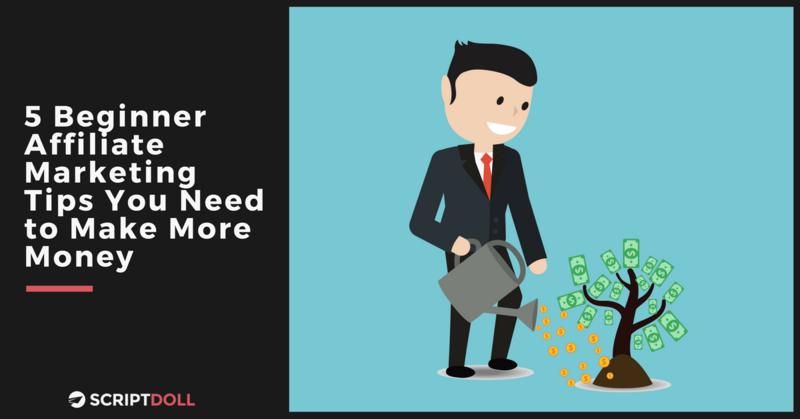 So, today, I’m sharing my five favorite not-so-secret tips you need to make more money in your affiliate marketing efforts. 1. Know who your ideal customer really is. I feel this is true for just about any new endeavor as an entrepreneur. And, for a good reason, because many often lose sight of who their ideal customer really is. They start focusing too much on what they think others would like or what they like themselves. But, more often than not, you are not your target market. There are critical differences between your preferences and those of your audience. Therefore, maintain a clear picture of who your ideal customer is and work hard to stay in tune with them—their wants, needs, dreams, preferences, challenges. When you do, it’ll be easier for you to choose affiliate products or services that are calling their name. And, ultimately, compelling them to buy so you can earn a sweet commission. 2. Pick & choose very carefully. One of the most significant burdens of being an entrepreneur is having to make plenty of tough decisions. And, most of the time that means on your own. After all, you determine and are in charge of your career success. Not anyone else. So, the last thing you want to do is make a rash decision, and go with an affiliate product or service another person claims is the best of the best. Instead, take your time to carefully pick and choose what would be best for your audience. Narrow down the list to one to two to start with, and if you’re not already, become very, very, very familiar with those you choose to market. If you aren’t, how can you know that what you’re promoting to your audience is a reliable resource and something they’ll find to be of serious value? Love it or leave it. It’s that simple. Also, your choice affiliate products or services of choice should be in context of what you’re doing. Meaning, they should complement your very own product or service. For example, if you’re offering chiropractic services, it would make the most sense to promote a cervical neck pillow rather than a random healthy cookbook. If you’re unsure of where to get started in picking and choosing the best of the best for your business, our favorite programs on the market include ClickBank, JVZoo, and Amazon Associates. For even more options, RaelynTan.com provides a super helpful blog post featuring the 18 most popular in today’s context. 3. Be transparent about your affiliate relationships. “A lack of transparency results in distrust and a deep sense of insecurity,” the Dalai Lama once said. And, that couldn’t be truer for every aspect of your business. When you join an affiliate marketing program, it’s essential to be open and honest in regards to the commission you’re earning as part of sharing affiliate product or service links. And, not just so your customers will love and appreciate you more. But, also so the good ‘ole FTC doesn’t come knocking on the door of your corner of the webosphere. Placing a disclosure statement near affiliate links in your sales materials and on your website, and repeating as necessary, ensures you follow FTC guidelines. Disclosure: Some of the links below are affiliate links. That means—at no cost to you—I will earn a commission if you click through and make a purchase. Incorporating that into your sales pieces might make you feel a little icky and leave you wondering, “Why would anyone click through if I can benefit from it?” But, oh they will. Especially if you’re sharing a product or service that can benefit them. Lastly, it’s important to note: I’m no lawyer, but I will say that you must be proactive and consistent in your disclosure efforts. If you don’t, it’s just an accident waiting to happen. Man, do I love that. Do you want to know why? Because far too often, entrepreneurs expect results in 5 minutes or less. And, they end up disappointed because they didn’t accomplish their ambitious goals as fast as a microwave warms up food. So, lay off instant gratification and start following the crockpot mentality—being patient while various “ingredients,” so to speak, blend and cook for some time before you experience results. Especially in the world of affiliate marketing. I hate to break it to you, but you can’t expect to start rolling in the dough from the get-go. Yes, while you won’t need to create the products or services on your own (which will save you time in the long run), you will need to put in the work to make this strategy worth your while. Know there will be waiting periods—for your affiliate application to be approved, your commission to be confirmed/approved, your bank account to actually receive earnings, and so much more. Just be patient and persistent because far too many people give up right out of the gate. Hey, they’re following that infamous microwave mentality! Don’t be like the rest of them. 5. Don’t be afraid to test the waters. Then, test again. In the end, becoming a successful entrepreneur is all about taking risks. You’ll win some, and you’ll lose some. But, no matter how many times you experience losses and complete fails, you’ll pick yourself back up and try again. Therefore, when it comes to your affiliate marketing efforts, don’t be afraid to test the waters. Then, test again. You’ll find that what works for some entrepreneurs, might not work for you. After all, it’s not a one-size-fits-all, make-money-quick strategy. So, give a program a go. If you find you’re not getting the most significant results, keep searching for the best of the best that’ll help you (and your customers) be the most successful. If you’re ready to get started, here’s how you can advertise affiliate products or services. Add the product or service to a bridge page on your website. Create a VSL to highlight the product or service on your bridge page. Craft an email sequence to tease the product or service and direct traffic to your bridge page. Write a detailed product or service case study, and post it to your blog/promote it on social media. Host a training webinar on the product or service. Mention the product or service in an epic content blog post for your website. Add the product or service to your opt-in freebie or lead magnet (ex. Ebook, checklist, etc.). And, there you have it: five beginner affiliate marketing tips you need to make more moola. Cha-ching! This strategy really is growing and growing in the entrepreneurial world, and there’s enough room for every person to grab hold of their fair share. I’ll leave you with this: you need to get the attention of your ideal customers to make your affiliate marketing efforts even more successful. So, I’m offering you a FREE copy of “The Top 50 Ways to Ramp Up Traffic to Your Sales Page,” delivered straight to your inbox. All that’s required to get your hands on it is your email. Just drop it into the box to the right-hand side of this page, and you’ll get it right away! If you’ve tried affiliate marketing before, what was your experience? Or, do you have questions about how to get started? Let me know in the comments section below.